Transfer funds, get statements, configure your trading account all in Account Management. Access quick start overview, menu guide, and user guides. Samples of documents in account registration system, disclosures, tax forms, customer service forms, and ID requirements. User & access rights for funds, reports, trading access, user management, and authorizations. Fund transfers, position transfers, transaction history, and FAQs. Instructions for successfully closing your account. View reports, dates, W-9 forms, and FAQs. 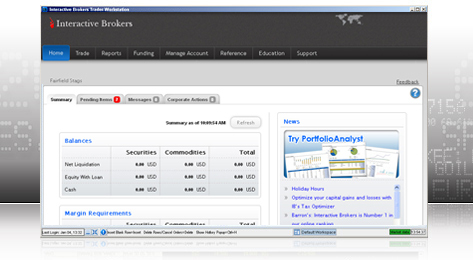 Access the portfolio analyst section within your IB account. See your statements within your IB account. Access the Deposits & Transfers section within your account. Access the Withdrawals section within your IB account. Access the Funds Status section within your IB account. See IB contact information and tips for best service.